I think we all need to spend some time in a happy place. Amidst the Sturm und Drang of fiscal cliffs and sequestration, the forces of darkness seem to have descended upon the landscape of science policy. But we must resist abandoning hope in the maelstrom of modern politics. My brothers and sisters, there is a world beyond the pain and suffering of this imperfect present. I ask you to believe that we can reach this paradise, where policymakers provide stable funding profiles, spacecraft launch on time, and graduate students are fed, clothed, and happy. You don’t have to take my word for the existence of this better world. You need only consult the Good Books. I refer, of course, to the decadal surveys published by the National Research Council. Joking aside, these decadal surveys are basically the Bibles of space science. They take years to prepare, but the effort is worthwhile; federal agencies use these reports to decide what gets funded and what doesn’t. Fields like astrophysics proceed in the directions specified in these surveys, as far as fiscal constraints allow. Today, following my earlier posts on the federal budget process and NASA’s strategic direction, I’d like to provide a brief overview of the decadal survey process. I’ll also summarize the most recent decadal surveys for astrophysics and planetary science and explain how their recommendations are faring in our current political climate. (Sneak peak: we thought we’d have more money.) I hope you’ll see that there is a plan for the exploration of the cosmos; we just need to muster the pecuniary courage to embark on our voyages of discovery. What is a decadal survey? Decadal surveys are 10-year plans for individual scientific fields, developed by scientists for policymakers through a multi-year process coordinated by the National Research Council (NRC) of the National Academies. Space science requires centralized, long-term planning because individual missions involve thousands of personnel and billions of taxpayer dollars. Unlike, say, biology, where scores of laboratory groups may independently pursue similar projects, astrophysics and planetary science cannot afford much duplicative effort. For example, we can’t launch fifty infrared space telescopes in the next decade—we only have JWST. The decadal survey process forces scientific communities to reach a consensus about the current state of a given field and the top priorities for the future. 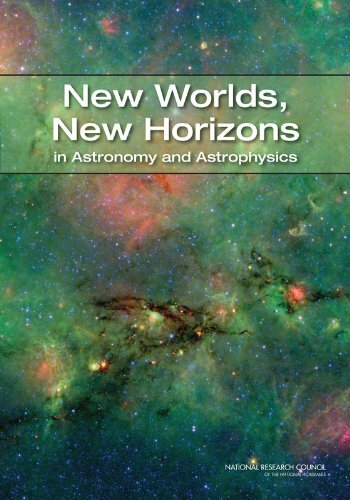 The latest decadal survey for astronomy and astrophysics (New Worlds, New Horizons, aka NWNH) was released to the public in 2010. The survey process began in 2008, when the NRC convened a steering committee of expert scientists and engineers. 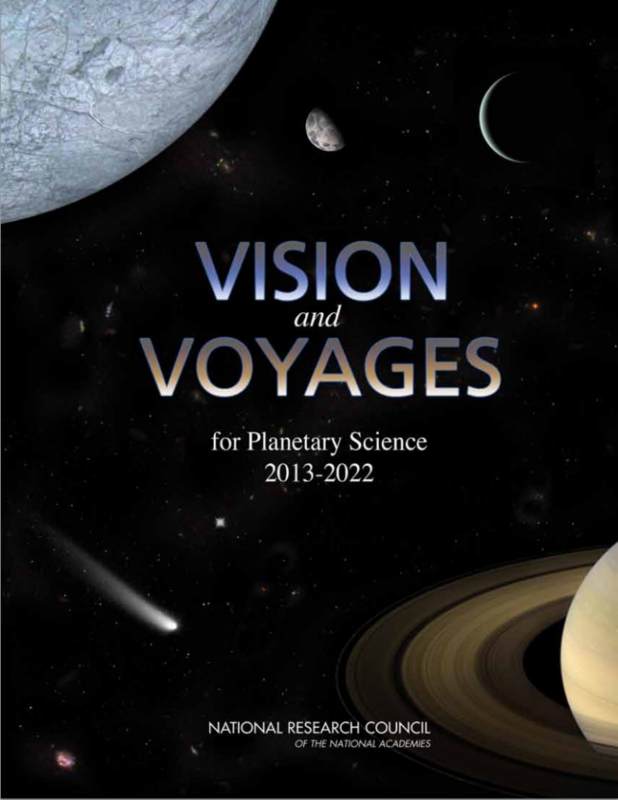 Work on the newest decadal survey for planetary science (Vision and Voyages, aka V&V) began later that year and finished in 2011. According to the 2010 NASA Authorization Act, NASA is required to “take into account the current decadal surveys.” Similar language can be found in legislation governing other agencies. In practice, federal agencies heed these surveys; even as funding profiles change from year to year, NASA and the NSF strive to achieve the scientific goals enumerated in these reports, although space missions that actually fly, for instance, may not look exactly like the concepts detailed in the surveys. Decadal surveys are products of entire communities. The NWNH committee, for example, appointed five science frontier panels that defined broad scientific goals and four program prioritization panels that formulated research activities to achieve those goals. Similarly, the steering group of the V&V survey turned to panels focused on areas of the Solar System (inner planets, Mars, giant planets, etc.) for recommendations about specific missions. Hundreds of scientists directly served on these panels and committees; hundreds more, including graduate students and postdoctoral scientists, submitted white papers, which provided in-depth, technical looks at particular issues and mission concepts. Members of each steering committee held town hall meetings across the nation. Each decadal survey identifies a portfolio of programs, facilities, and missions that should provide the highest scientific return per dollar. The collective creativity of the space science community churned out many more good ideas than could be funded under even the most optimistic budgetary projects. So, the inevitable prioritization disappointed some people, but elated others. Still, most everyone recognizes that decadal surveys are powerful documents because they are consensus documents. The NRC maintains standing committees to guard the spirit of each decadal survey, ensuring that research programs stay faithful to the plan. The cover of the 2010 astrophysics decadal survey. If you read this, you’ll learn a lot, but you’ll also be very sad that few of these missions are happening anytime soon. The NWNH decadal survey identified three scientific objectives for the 2010-2020 decade: the search for the first stars, galaxies, and black holes, the quest to find nearby, habitable planets, and the ongoing effort to understand the basic physics of astrophysical phenomena. These three themes are large umbrellas that collectively cover almost all astrophysics research. The report listed a specific program of activities, focused on space and ground projects, which are explicitly prioritized. Groups of projects are categorized with their total appraised cost. Small, medium, and large space projects, for instance, have costs <$300 million, $300 million to $1 billion, and >$1 billion, respectively. A large ground project, in contrast, is any activity with a total cost >$135 million. The single highest priority for space-based astrophysics is the 1.5-meter Wide-Field Infrared Survey Telescope (WFIRST). Other top priorities include technology development for future exoplanet missions and augmentation of the Explorer program of small and medium-sized missions, which are selected competitively after periodic calls for proposals. No one expected the entire NWNH program to be executed in this decade; every decadal survey is effectively a wish list, an example of what would be possible with abundant resources. But scientists usually expect that their top priorities, at least, will be funded. Unfortunately, the NWNH decadal survey has been essentially shelved until the launch of JWST, which probably won’t occur before 2018. (JWST was the top priority in the 2001 astrophysics decadal survey.) There simply isn’t enough money in the current budget to do anything new in astrophysics. Continuing to support existing missions and facilities is even proving difficult. The recommendations of NWNH haven’t proven particularly controversial, so the top priority missions now will still probably be preferred in 2020. One notable exception involves exoplanets. NWNH only discussed technology development programs, but actual exoplanet mission concepts will likely mature during the next few years. The V&V decadal survey is similar in many respects to NWNH. The survey starts with a list of scientific goals for the future exploration of the solar system and then presents a prioritized set of missions that would achieve these goals. Space missions are divided into three classes—flagship (large), New Frontiers (medium), and Discovery (small)—based, again, on total appraised cost. Planetary scientists are especially adamant that their recommended profile of activities is a balanced mixture of missions of different size classes to different parts of the solar system. Watching the hopes and dreams of the astrophysics community being swallowed by JWST cost overruns instilled a healthy fear of the same thing happening to planetary science. So, V&V explicitly stated that the first casualty of cost overruns or constricted budgets should be flagship missions. Discovery-class missions, technology development projects, and individual research grants should be preserved for as long as possible. This is hugely important! The planetary science community prefers frequent small missions to once-a-decade behemoths. This decision ensures a constant stream of new scientific discoveries, preventing the community from stagnating during the long lull between flagship missions. The astrophysics community, in contrast, believes that the huge scientific potential of JWST, in particular, is worth the risks of having many eggs in one proverbial basket. The public and the news media, however, need a soundbite, a top priority to grab onto. The highest-priority flagship mission for the 2013-2022 is the Mars Astrobiology Explorer-Cacher, the first of three missions dedicated to the retrieval of carefully selected samples from the surface of Mars. The next two recommended flagship missions, in rank order, are the Jupiter Europa Orbiter and the Uranus Orbiter and Probe. New Frontiers missions should be selected from a menu that includes, among others, the Venus In Situ Explorer and a sample return mission to the Moon’s Aitken Basin. So, even though the New Frontiers missions technically have higher priority than the flagship Mars mission, most people heard that planetary scientists wanted, more than anything, to bring back samples from Mars. Just as people believed that the end of the Space Shuttle program signalled the death knell of human spaceflight at NASA, so does the Mars program stand in for the entire planetary science research enterprise in the public eye. Like NWNH, the planetary decadal survey has encountered strong headwinds. The White House, fearful of a JWST-like debacle, pulled the plug on the Mars sample return campaign, at least for now. Announcements of opportunity for New Frontiers and Discovery missions have been delayed as budgetary projections are continually revised downwards. Still, planetary scientists are currently operating an impressive constellation of missions around myriad solar system objects. Our challenge is to make sure that our Golden Age of exploration continues. The decadal survey process is an essential exercise for the space science community and an invaluable source of information for policymakers and the public. But progress on the prioritized programs of activities has not been as rapid as desired. More than anything else, the suddenly worsening fiscal climate doomed any chance of accomplishing the recommended programs in full. Still, most scientists are resolute in sticking to the goals elucidated in these surveys, even if much less progress is possible than hoped. At the end of this decade, we will regroup to write new surveys. Our experiences now, in this rather unfriendly climate for Big Science, will be invaluable as we plan our future explorations of the cosmos. I am a first-year graduate student in planetary science at the California Institute of Technology, where I work with Heather Knutson and David Stevenson. My research interests include the formation of gas giant planets, the internal structures of icy satellites, and the thermo-chemical evolution of terrestrial planets. My favorite planet is Venus and my favorite ice cream flavor is mint chocolate chip. I received my bachelor's degree in Astronomy & Physics and Geology & Geophysics from Yale University in May 2012. Wanted: A Strategic Direction for NASA The Sequester and the Research Scientist Budget Battle Update: Dueling Visions for NASA The Midterm Assessment: How’s it coming?